A proud breed by any name, this breed has survived in some of the harshest terrain in the world, sharing the struggle, and later the accomplishments, of its human counterparts in survival and adventure. Eskimo dogs have served nearly all the famous names in arctic and Antarctic exploration. 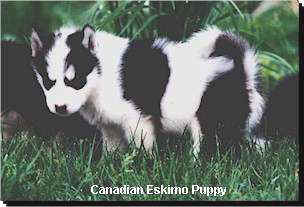 Beautiful, proud, loyal and kind, the Canadian Eskimo Dog (CED) was historically a draft animal and all around worker. The breed was used for sledding and packing, and also as a hunting dog for the Inuit. In some parts of the Canadian North these dogs are still found sniffing out seal-breathing holes or holding the polar bear at bay during hunts. It would be hard to envision the ancient Inuit people coping with the polar conditions without these dogs. Early expedition use of the Eskimo Dog brought him not only into demand and respect, but put him under the eyes of the scientific community during the 1800's and early 1900's. It is said that a Canadian Eskimo Dog can pull twice his weight and still cover up to 70 miles per day in some of the most rugged terrain in the world. It is sad that a dog with such a distinguished history and so perfectly suited to its purpose, would be so little known to dog fanciers. Even among dog racers the Eskimo Dog is rarely utilised. Much of the Eskimo Dogs identity problem of today lies in the fact that their actual numbers remain so low. The plight of the Eskimo dog over the past few decades has been a sad one, as little effort was extended to introduce this proud breed to the general public and, therefore, the breed has become almost forgotten. In the fifties it is believed that 20,000 animals lived in the Canadian North, with still more found in the U.S. where they were being registered at the time. In 1959 the American Kennel Club dropped the dog from their recognised breed ranks due to lack of registration. With the introduction of Snow Machines to the Canadian North, the Eskimo Dog numbers steadily decreased. By 1963 only one Canadian Eskimo Dog was listed with the Canadian Kennel Club Registry. No more were registered thereafter and the breed was deemed extinct as far as official recognition. At this time on the Northern front, less than 200 pure animals still existed in the North. In 1972 a project was created to try to save the Canadian Eskimo Dog. 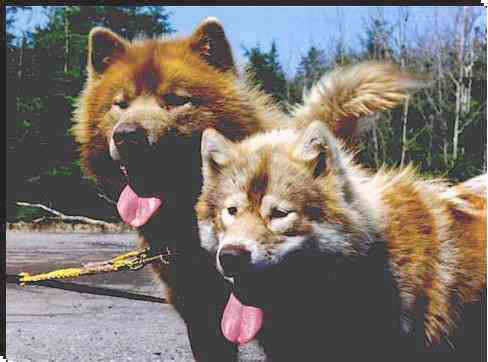 Bill Carpenter and John McGrath, with the assistance of the Canadian Kennel Club (CKC) and the Canadian Government, began the Canadian Eskimo Dog Research Foundation (CEDRF) in Yellowknife, NWT. The resurrect began, and in 1986 the first dogs from this project were registered with the CKC. With this initial addition to the gene pool, the foundation stock of the registered breed we know today was established. 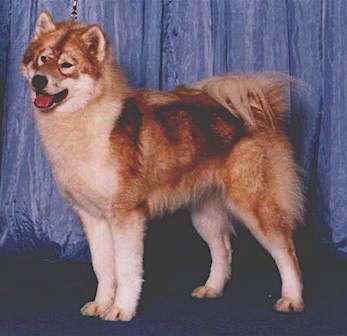 A sturdy spitz-type dog, weighing from 65 to 85 pounds for males and 40-65 pounds for females. The average height at the shoulder extends from a low of 20 inches for females to as high as 28 inches for large males. The animal on the whole, has a powerful physique with a thick neck, broad chest and strong, thickly muscled legs. The feet are densely furred and the thick double coat is completely weather proof. The colors and color combinations often range through white, grey, brown, sable, black/white, red/buff, red/white and colored patches on the head with a white body. Any dog color is acceptable and random coloring is desirable. With a zest for life and a gentle disposition, Canadian Eskimo Dogs make wonderful companions for the active or outdoors minded, and hard working sled dogs for the serious musher - or the recreational team. In spite of their ruggedness, strength and stamina, the breed as a whole is playful and submissive. The Canadian Eskimo Dog is alert, curious and very intelligent. He is easy to train, and once commands have been mastered, he never forgets them. His memory is phenomenal. To hear the wolfish singing of an Eskimo Dog is to be irresistibly drawn to him for life. Not so stubborn as most northern breeds, nor prone to wander like others, the Eskimo Dog thrives in most climates. 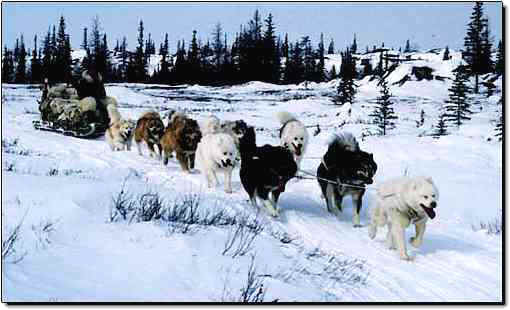 Today the breed exists mostly as companions on small recreational teams and as traditional transportation for tourists in parts of the North. A small number of breeders also exhibit their dogs at CKC sanctioned dogs shows throughout Canada. Those who love this breed will continue to work hard in the maintenance of its numbers, its genetic diversity - and, most importantly, its working integrity. To those true admirers there is an undeniable appeal in the timelessness of this breed... in the confidence a dog which has dutifully served its human counterparts for centuries...through famine and prosperity, adventure and survival. For those few, the Canadian Eskimo Dog is truly one of Canada's "Best Friends."